The latest Quality of GSM Network results released by the Mumbai based Pyro BKP Telecom Consultant have rated Vodafone Essar as the number one operator in Mumbai followed by Loop Mobile (formerly known as BPL Mobile) as number 2 , Idea Cellular as 3 and Bharti Airtel in the forth position for network quality in Mumbai telecom circle. The Research Survey conducted on four private telecom operators in Mumbai by leading wireless network consultancy service agency Pyro BKP Telecom Consultants Pvt Ltd. The Benchmarking drive test was conducted using a “Nemo Network Analyzer” Tool and cover total distance of 2054 Km across the length and breadth of Mumbai city. 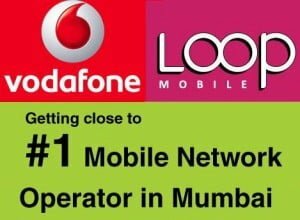 In this Survey Loop Mobile network emerged with Minimum Blocked and ranked number one in call set up success rate and GPRS Data Speed.While Mumbai’s largest GSM mobile service operator Vodafone holds the first position for better quality and minimum call drops. Loop Mobile ranked number 2 in over all ranking a wafer-thin margin,Vodafone had better on Road and outdoor network coverage compare to all other private operators. The Survey data was collected during the business hours of 09:00 to 18:00 and Nokia Handsets were used while conducting the survey.Following factors were looked into it Call Set up Success rate, Call Drop Rate, Blocked call rate, % of No Service Locations, On Road Coverage Laval and Handover Success rate. I do not agree with one word that has been written. Loop mobile has the worst network in Mumbai and the worst of service with executives who do not know English and manners. The executives at the store are also extremely rude and have no etiquette or manners. I am from Mumbai and have used Reliance GSM, Loop Mobile, Vodafone and Airtel on not one but 5 of my numbers. Telecomtalk seems to have been paid for this stupid review and ratings.